At a ceremony last Friday (Aug. 25) in which the National Science Foundation's Green Bank Telescope (GBT) was formally dedicated, U.S. Senator Robert C. Byrd (D - WV) announced that the gigantic telescope had successfully opened its two-acre 'eye' on the Universe earlier that week. The telescope was christened the "Robert C. Byrd Green Bank Telescope" at the ceremony, which was held at the National Radio Astronomy Observatory (NRAO) site in Green Bank, West Virginia. The event also featured remarks from Dr. Rita R Colwell, Director of the National Science Foundation. The Robert C. Byrd Green Bank Telescope saw 'first light' (that is, detected its first radio waves from space) at 7:00 p.m. EDT, Tuesday, August 22, 2000. Earlier that day, a 403-megahertz radio-wave receiver had been installed on the telescope. In its first simple observation, the GBT tracked a radio galaxy called 1140+223 across the sky. 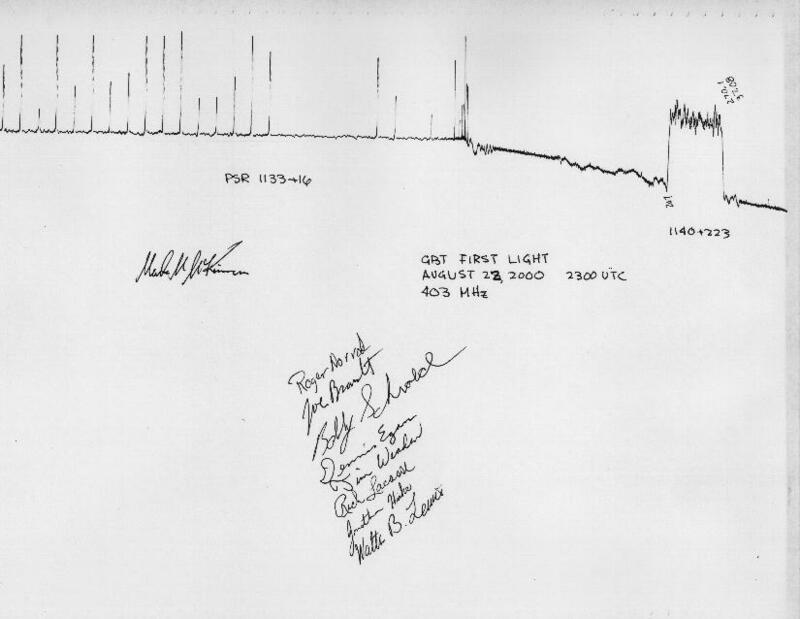 The telescope then locked onto a pulsar called PSR B1133+16 and a chart recorder scratched out the regular pattern of its radio pulses, which reach Earth every 1 2 seconds. (A pulsar is a rotating neutron star that shines a beam of radio waves like a cosmic lighthouse; these radio pulses sweep across the Earth at regular intervals.) Dr. Mark McKinnon, Deputy Site Director at NRAO's Green Bank site, led the team that conducted the observations. "This first-light event is the most significant milestone in the construction of the GBT. It is the first step in commissioning this telescope," McKinnon said. "This shows that the receivers we built for the GBT work, and that the telescope is properly aligned. We have a working telescope." "The next phase is the telescope commissioning," McKinnon continued. "That means we measure the telescope's performance, and make detailed refinements of its pointing and focusing." The GBT is scheduled to begin regular scientific observations in the first quarter of 2001. For further information on the GBT, or to download high-resolution images of the telescope, please visit the GBT Dedication Homepage.